Despite not having any kids, I tell as many dad jokes as James Ward – who is the father of one – and, we both like Holden Camiras. This should help you understand why we’re barely the last word on style, especially in the Melbourne CarAdvice office – we leave that for newcomer James Wong. Our collective style score quadrupled the day we jetted off for a drive around the bay in the 2016 Mercedes-Benz C300 Coupe and the BMW 430i. We were about to experience the life of a person that owns a ‘non-performance’ variant of a sports car. Before we set off, we weren’t sure what to expect. We didn’t think that these two cars would have the same street cred as their muscly siblings, let alone be as enjoyable to drive through a set of bends. Their muscly siblings are of course ones with AMG and M badges – cars that treat rear tyres like well-used primary school erasers. To make sure we covered all gamuts of this test, our drive route would see us circle Port Phillip Bay starting from Melbourne, via Geelong and Queenscliff to board a ferry for Sorento, up Arthur’s Seat and back to Melbourne again. It’s the perfect mix of highway, country roads and windy roads. The white C-Class Coupe may look familiar. It’s our long-term loan car. The week we did this test, it was getting ready to be shipped back to Mercedes-Benz. We had put thousands of kilometres on the clock and it had been driven from Sydney to Melbourne just for this test. Needless to say, we had become quite attached to it. To ensure everything was fine and dandy with the car, Mercedes-Benz requested to inspect the car prior to this comparison, to which we obliged. Priced from $83,400 (plus on-road costs), the C300 Coupe is the most expensive non-AMG C-Class Coupe on the market. Our test car had a number of options fitted, including the $4490 Vision Package (which includes active headlights with automatic high beam, head-up display and an electric sunroof), the $490 Air Balance fragrance package and $690 heated front seats. The C-Class Coupe range starts from $65,900 (plus on-road costs) for the C200 Coupe and goes up to $162,400 (plus on-road costs) for the C63 S AMG Coupe. A cracking 13-speaker sound system; 19-inch alloy wheels; dual-zone climate control; seven airbags; Bluetooth phone and audio connectivity; blind spot monitor; brake assist; front, rear and side cameras; front and rear parking sensors; forward collision alert; radar cruise control; LED daytime running lights; electric seats; steering wheel mounted paddle shifters; satellite navigation; automatic headlights and wipers; lane departure warning; leather seats; electric park brake; semi-autonomous parking; power boot control; DAB+ digital radio; rear cross traffic alert and tyre pressure monitor. In terms of other options (aside from those fitted to our car), there’s only air suspension ($2990), alarm ($990), climate controlled front seats ($1400), a TV tuner ($1490) and optional paint colours (pricing varies between $1990 and $2990). Powering the C300 Coupe is a 2.0-litre turbocharged four-cylinder petrol engine that produces 180kW of power and 370Nm of torque. It sends its torque to the rear wheels via a seven-speed automatic transmission. 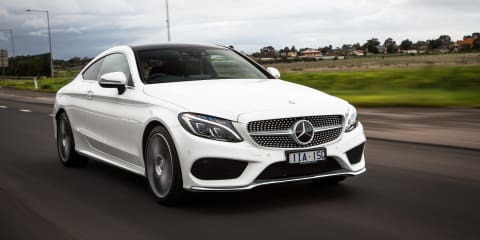 The Benz uses a combined 6.6 litres of fuel per 100km, which is pretty reasonable considering the feisty four-cylinder engine and 1565kg kerb weight. Mercedes-Benz claims a 0-100km/h time of 6.0 seconds, which was way off what we were able to achieve, with our figures coming in around 1-1.5 seconds slower consistently. However, the surface was slightly damp at the time of testing. 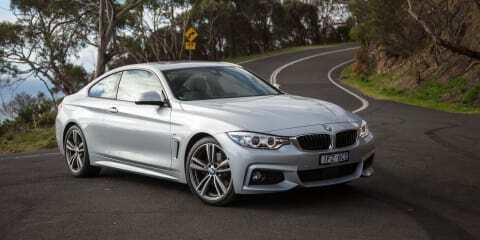 It’s much the same with the BMW 4 Series on the pricing and specifications front. Pricing starts from $68,900 (plus on-road costs) for the 420i and climbs all the way to $294,715 (plus on-road costs) for the limited edition M4 GTS. The 430i tested here is priced from $79,855 (plus on-road costs), making it around $3500 cheaper than the C-Class Coupe. Our test car came with a few options, namely radar cruise control ($1600), power sunroof ($2920), Internet connectivity ($200), metallic paint ($1840) and the M-Sport package (NCO). Like the C-Class Coupe, the 4 Series range comes loaded with standard kit, including: nine-speaker sound system; 19-inch alloy wheels; dual-zone climate control; six airbags; Bluetooth audio and phone connectivity; blind spot monitoring; front, rear and side cameras; front and rear parking sensors; proximity entry and start; autonomous emergency braking; LED daytime running lights; leather and electric seats for first row; steering wheel mounted paddle shifters; satellite navigation; automatic bi-xenon headlights; lane departure warning with passive steering; launch control; power boot control; DAB+ digital radio; tyre pressure monitoring and run flat tyres. Unlike the C-Class Coupe, BMW offers a number of options that range in price from $200 to $5700. Some of these include special paint colours and LED headlights all the way through to a digital TV tuner. Under the 430i’s bonnet is a 2.0-litre turbocharged four-cylinder petrol engine that produces 185kW of power and 350Nm of torque. The BMW sends torque through an eight-speed automatic gearbox to the rear wheels. Fuel consumption is almost 15 per cent less than the C300 Coupe, coming in at 5.8 litres of fuel per 100km. BMW also claims a faster 0-100km/h time of 5.9 seconds, which we failed to match by around 0.5 seconds. The striking C-Class exterior design continues inside the cabin. Acres of wood and S-Class inspired switchgear leaves a lasting impression. Ergonomically, everything is within easy reach and the clever use of seat controls on the door trim becomes second nature. Additionally, the lack of gear shifter means there is plenty of room in the centre tunnel. That includes a sizeable storage area between the driver and front passenger. But it also reveals the clumsy controller that sits ahead of the storage area. It can be hard to see buttons on the passenger side of the controller and its integration with COMAND can be a bit confusing. The seats are very comfortable with a heap of side and bottom support. The same can be said for the AMG-inspired steering wheel, which sits nicely in hand and features all the buttons necessary for driving without taking your eyes off the road. Trip computer functions take place on an LCD display that sits between the speedometer and tachometer, while main vehicle settings can be changed using the 8.4-inch COMAND infotainment screen. That leads us to the infotainment system. The sound system is sensational and offers a heap of bass and very clear high frequencies. Audio comes in the form of AM/FM radio, in addition to DAB+ digital, along with a host of alternatives such as Bluetooth, auxiliary connectivity and USB. Despite recent changes and usability improvements, COMAND still isn’t amazing to use. There’s an excessive amount of clicks and menus to reach the setting you need. Entering navigation destinations can be time consuming, as can browsing through radio stations — especially on the digital frequency. Mercedes-Benz does make up for this with an excellent voice recognition system. It’s very accurate and can be used to enter full navigation addresses or even call the hardest contact names. While you’re unlikely to constantly carry passengers in the rear seats, we jumped in the back to see how much room was on offer. Both the BMW and Mercedes-Benz seat four. The section between the rear seat passengers offers a storage hole and cup holders. Leg room is good, but not amazing, likewise with head room. It’s a slightly cramped space, but once you’re settled in it’s comfortable. I wouldn’t want to be sitting there for a long time, though. The backrests do fold, but not completely flat, meaning you could fit larger and longer items if required. Boot capacity is a modest 400 litres — some 80 litres less than the BMW. You won’t find a spare tyre under the boot floor either, with both the C-Class Coupe and 4 Series featuring runflat tyres. The 430i’s interior takes on a very different approach. While it’s not as elegant, it’s typical BMW and feels better built and more solid in comparison to the C-Class Coupe. Where Mercedes-Benz opts for minimalism, BMW seemingly goes for the million buttons approach. There’s also more space taken up by the manual park brake — it’s electric in the Mercedes-Benz — and the gear lever, both items eating into the available space for centre console storage. The M steering wheel sits nicely in hand, with the thin design housing buttons for cruise control and infotainment. Speaking of infotainment, the 4 Series uses BMW’s iDrive system, which we consider to be best in the business. The 10.2-inch colour infotainment screen is driven by an iDrive circular controller and features logical menus with easy shortcut buttons. We found it far easier to scan through DAB+ digital radio stations as they were all presented in a vertical list, as opposed to a rotary display as in the Mercedes-Benz. The voice recognition system is on par with Mercedes-Benz, offering easy and clear voice inputs for things like satellite navigation destinations and phone contacts. An excellent nine-speaker sound system is backed by a number of music streaming options, such as radio, Bluetooth and a several auxiliary connection methods. While the seats offer a heap of side support, they lack adequate support in the bottom. But they are easily adjusted to squeeze around the hips and hug you in tight. In the second row, it’s also tight in terms of leg and toe room, but the 4 Series roofline affords slightly more head room. There’s also the added versatility of a fifth seat should you require the extra space — mind you, fitting three across the second row would be hard work. Cargo capacity is an impressive 480 litres, while the second row folds in a 60/40 split to an angle, but not quite flat. This offers extra space for longer items that wouldn’t normally fit within the boot. While the 4 Series offers more room and a sturdier feeling interior, it’s the C-Class Coupe that really impresses. The interior is very well presented and makes the car feel like it’s worth much more than it actually is, which isn’t an easy feat in this price bracket. Before we even mention a single word on how these two drive, we need to point out public reaction to both. We mentioned earlier in this review that James and I both prefer the go-fast variants of these cars, so we weren’t sure what to expect with the ‘cut-price’ variants. We were both blown away with the reaction these received on the open road. The BMW impressed punters with its sleek design and long body, but it was the Mercedes-Benz that stole the show. So much so, that James almost scored a date with the (older) lady manning the ferry-ticketing desk. She was one of many that commented on how impressive the C-Class Coupe looks, especially in its striking white colour. It probably didn’t help that the 430i was finished in the most boring colour known to man, or that the interior looked… eww. With a nicer colour, tinted windows and a respectably coloured interior, we think the BMW would have turned a few more heads. As it stands, though, the Mercedes-Benz was the clear crowd favourite. But, was it our favourite on the road? Only one way to find out. James and I saddled up for our trip around the bay. The first stretch was a highway run of around 80km, where we had the chance to measure sound in the cabin, radar cruise control and assess fuel consumption. The C300 Coupe uses a more advanced version of radar cruise control that quickly responds to breaks in traffic and accelerates sooner when changing lanes with clear traffic. It’s also unique in the sense that it offers a semi-autonomous mode that allows the driver to operate the vehicle without holding the steering wheel. While it sounds good in theory, the system is far from being as effective as AutoPilot in the Tesla Model S and X, which allows longer periods of driving without driver intervention. It also allows for greater vehicle steering input — the Mercedes-Benz limits steering input on tighter freeway bends and can sometimes have a pinball effect in its lane when it overcompensates steering inputs. During this stint, the C300 Coupe measured an ambient cabin noise of 63dB at 100km/h on a coarse surface. This is a pretty impressive figure and indicates good sound deadening from both the engine and road (the BMW, as a comparison came in at 65dB at the same speed and on the same stretch of road). Surprisingly, the Benz used a hefty 8.0L/100km during the highway section of the drive, which was considerably more than the 5.5L/100km in the 430i over the same stretch of road. In terms of ride comfort; the Mercedes-Benz was good, but a little firmer than it needed to be. The seats were comfortable and offered plenty of side and bottom support, which would come in handy for the windy mountain stretch we were making our way toward. Steering feel at highway speeds was accurate and responsive. The electrically assisted steering rack features a variable ratio, which allows the steering to variably adjust ratio when the car feels it necessary in relation to speed and driving mode. The available driving modes allow the driver to move through an economy mode, right through to a Sport+ mode, which puts the gearbox and steering into their sportiest setting and restricts stability control intervention to offer a sporty drive. Without selecting the air suspension option, the damper firmness can’t be adjusted. This became more of an issue when we left the highway and drove on some country roads that were undulating and poorly finished. Road abrasions would be sharply transmitted through the chassis, while the steering would kick at times through corners with mid-corner bumps. There were times that sharp bumps collected during cornering would cause the car to shuffle along the road laterally, which wasn’t overly confidence inspiring. It was around this point that we started noticing two rattles from within the dashboard — one on the driver’s side near the air vent and another on the passenger’s side. The rattles would occur when the tyres contacted a bump or travelled over an uneven section of road. It became quite annoying and wasn’t befitting of a luxury cruiser. On the windy mountain run, the C300 Coupe’s engine was sharp and offered quick response, but it was ultimately let down by an overly intrusive stability control system. Out of corners when throttle was fed on, there was a sudden change from traction to no traction; it wasn’t as progressive as the BMW, which made it hard to drive. We found that the Benz couldn’t keep up with the BMW on the same run because the traction control system would continuously bog down on torque delivery. But, where it lost out on cornering and acceleration, it make up for in braking. The brake pedal felt firm and offered plenty of feedback. It was confidence inspiring and never left you in the lurch. The rotors offer cross drilling for even greater braking performance. In the sportiest drive mode, the steering firms up nicely and offers a progressive variable ratio. It can easily be fed in and the steering wheel is the perfect size to lob the C300 Coupe through bends. Inside the cabin, it was also noisier thanks to artificial engine noise induction. The sports exhaust also helped enhance the exterior noise proposition too. During both regular driving and harder driving, the C300 Coupe’s seven-speed automatic gearbox could be clumsy at times and a bit jerky. It wasn’t as smooth as we would have liked, especially at low speeds. Gears can be manually selected using the steering wheel mounted paddle shifters. Over in the BMW, it’s not hard to see why BMW builds its brand around the slogan ‘ultimate driving machine’. On the highway run, it used barely any fuel and felt the most comfortable. Variable dampers come standard on the 430i with M Sport package and offer the perfect balance between ride comfort for highway cruising and sportiness for mountain runs. Despite being slightly louder at cruising speed, it made up for this with an excellent ride on the rough surfaces of the country stretch of road. Both vehicles were fitted with 225mm wide front tyres and 255mm wide rear tyres and 19-inch alloy wheels and despite this, their rides were vastly different. Where the Mercedes-Benz bucked about at times on rough portions of road, the BMW soaked up mid-corner bumps and sat flatter through tighter stretches. The steering also offered superior feedback with a natural feel that wasn’t overly assisted. The difference became even more apparent when we drove up our mountain stretch. Like the Mercedes-Benz, the 430i comes with several driving modes ranging from Eco Pro through to Sport+. Also like the Mercedes-Benz, the higher sport settings adjust throttle feel and steering feel, in addition to ride damping. In its highest setting, the 430i was settled and offered excellent communication through the chassis and steering. Progressive applications of the throttle led to predictable changes in direction and a highly communicative drive experience. We could easily push harder in the 4 Series and know that it would do as we expected, as opposed to surprising us with stability control intervention or a reduction in torque. The only thing we didn’t like about the 4 Series in comparison to the C-Class Coupe was brake pedal feel. In isolation it’s fine, but in comparison to the Benz, it’s soft and requires a great deal of force before it reacts as intended. In terms of the transmission, the 430i’s gearbox is very smooth at low speeds. It’s also fairly well placed throughout its rev and speed band to be in the correct gear at the right times. Eight gears is a lot to work with, but it manages to do a good enough job. Like the C300 Coupe, the 430i has steering wheel mounted paddle shifters, but it also has a launch control program. Activated by pressing the brake and the throttle at the same time and then releasing the brake, gear shifts are far more rapid and it allows the car to reach a 100km/h sprint from standstill around one second faster than the same run without launch control. We learned from this drive that while both vehicles feel comfortable in the urban grind, the differences open up significantly when they are pushed a little harder or when the road surface becomes more complex. The on road win definitely went to the BMW. When it comes to warranties, both Mercedes-Benz and BMW offer three year, unlimited kilometre warranties. In terms of servicing, it’s not as expensive as you think to own and service a German vehicle. Both Mercedes-Benz and BMW offer reasonable servicing pricing and allow for capped pricing packages. Mercedes-Benz is yet to confirm servicing costs for the new C-Class Coupe, but the brand does offer capped price servicing for the first three services (three years, 75,000km). The current C-Class and previous-generation C-Class Coupe cost $396 for the first service, $792 for the second and $792 for the third. On the BMW front, buyers can prepay for five years of servicing (or 80,000km) for $1340. This covers engine oil and filter, air, fuel and micro filters, spark plugs, brake fluid and a vehicle check. If Mercedes-Benz doesn’t alter servicing pricing, which we expect they won’t, it comes in significantly more expensive than the BMW to service. Okay, we’ve come to a conclusion. James and I, we’re not stylish. Well, we are when paired with these two cars, but not without them. So where does that leave us? Well, it leaves us with the realisation that the Mercedes-Benz C300 Coupe and BMW 430i are actually style multipliers. Anybody can jump into these cars and instantly become cooler and more desirable. It doesn’t matter that they’re not showered with AMG and M badges, they cut a sleek line in traffic and get plenty of attention — the C300 Coupe more so. As a driver’s car, the 430i wins hands down. It’s fast, it’s easy to drive and it’s the most confidence inspiring. It’s also damn quick for a car sporting a turbocharged four-cylinder engine. But, it’s the C300 Coupe that looks best and has the premium presented interior. So which should you buy? Well, here’s the issue. Both James and I would recommend the C300 Coupe. It comes loaded with plenty of equipment, the interior looks nice at first glance and it wears the all-important Mercedes-Benz badge. But, if we were handing over with own hard-earned, we’d buy the BMW. Why? It’s far more enjoyable to drive, the interior feels better and we’d both get sick of random older women hitting on us while we’re driving the Mercedes. It doesn’t happen often at CarAdvice, but we have a tie. If you want to be the hip trend setter, buy the Benz, if on the other hand you want to head out for a weekend blast on occasion and have a damn good time doing it, buy the BMW.